Russia may see a drop in the number of blood donors as a new law capping their payment takes effect. On Jan. 21, the law "On Donation of Blood and Blood Components" came into force. The law, which was passed in Russia last summer, prohibits donating large amounts of blood. In addition, payment for donations will continue only in cases where rare components and blood groups are being donated. As an incentive for unpaid donations, volunteers will be offered lunch instead. Also, the amount of annual payments to “honorable donors” of Russia (those that gave their blood and its components 40 times or gave plasma 60 times) is increased by 1.5 times, up to 9,959 rubles ($330). However, the law reduces the list of benefits provided to donors for transportation, housing services and utilities. Only intangible benefits remain: annual vacations at a convenient time, receiving priority medical care in state institutions, and the right to purchase tickets to a resort at a place of employment or study. 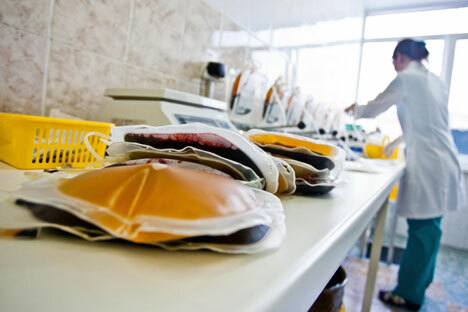 Prior to the enactment of the new law, donors in Moscow were paid 650 rubles for 100 milliliters (.33 ounces) of blood, and one could donate 400-500 milliliters at a time. Platelets were estimated at 4,500 rubles and erythrocytes at 6,000 rubles. The donors also used to receive compensation for additional nourishment at the amount of 1,000 rubles. Finally, the new law spells out in greater detail the conditions under which a person can become a donor. Now, not only Russians but citizens of other countries, as well as minors (if they are recognized as those having full legal capacity), may donate blood officially. Now, people come to us from three railway stations, because one can give blood for 1,000 rubles, and later we have to reject it. We spend the time and reagents, and all they need is to get the money. People come to us with someone else’s passports; they come after alcohol intake. It is necessary to remove this self-serving interest. It is necessary to explain that the best care for children who are in the hospital with cancer and need the blood components daily is donating blood by every person at least once in their lifetime. Indeed, a large part of those who donate blood for money are the people at risk. Among them there are many infected individuals, and the control causes significant difficulties. Among them, there is a lot of refuse. Therefore the global trend in medicine is to donate blood for free. But we all understand: there is a risk that in six weeks in Russia there will be no required amount of blood left. I hope very much that the Ministry of Health understands what it does and keeps its hand on the pulse. The voluntary unpaid donation is accepted and continues developing in the majority of countries in the world. The new Federal Law, which came into force in our country, also emphasizes the gratuitous donation. It is quite a good law, but hard work will be needed to carry it out. I think that the number of donors can seriously decrease. To have the unpaid donors come, information campaigns have to be organized and the blood banks’ work is to be rearranged. The blood transfusion stations need to operate at the hours convenient for donors, and not on weekday mornings, as it is now. I think that, by the number of donors, our country cannot afford to refuse anyone’s services. Moscow says it has no shortage of donors. And what’s there to say about the province where there’s one blood bank and it is empty? Under the new law, to receive the honorable donor status one must donate plasma 60 times or blood 40 times. I have 14 blood donations and 26 plasma ones. Previously, blood was counted at a factor of 1.5 to plasma, and I had, in fact, 47 donations. Now, 14 blood donations are not taken into account, so I’ve been cheated. I will continue to donate blood for the people, because they need it. I'll do it on my extra days off and with my money. But, as a permanent donor, I have been spit in the soul. The article is based on materials from Gazeta.ru and Moskovskiye Novosti.